Nintendo DS Tetris is now available! Will Tetris DS shape up to be a classic worthy of the Tetris name? Since the dawn of the DS, puzzle fans had been asking for Nintendo DS Tetris and now, thanks to Nintendo themselves, Tetris DS is a reality. Tetris DS is based on one of the best loved puzzle games of all time. Reviewing Tetris on Nintendo's super handheld makes me feel quite old, since I remember Tetris from the original Nintendo Game Boy and on just about every other platform I've ever owned. Back in the nineties there was even an LCD Tetris wrist watch, of which I was a proud owner. Thanks to the fact that Tetris is such a simple concept, this was one of those rare LCD games that was actually playable and not a mess of badly animated characters. My Tetris watch saved me from many hours of boredom as a child, but can Tetris on the DS entertain todays gamers? Expect Nintendo's typically high standards of presentation and fan-service. For anyone not familiar with the game, the object of Tetris is to arrange bricks of different shapes so that they form lines. The bricks fall from the top of the screen and must be arranged by moving and rotating them so that they fit together. Once a line of bricks is created, they are removed from play. Making two or more lines at once yields bigger scores, making four lines at once is called a Tetris. The concept is simple but frighteningly addictive and it is not difficult to see how this particular game has stood the test of time. When creating Nintendo DS Tetris, Nintendo wisely decided to cram a great deal of additional content into the game. Tetris DS includes no less than six different ways to play with those fiendish falling blocks. The game's presentation has been ramped up and sprinkled with typical Nintendo TLC too. Expect to see classic Nintendo characters scampering around the edges of the screens and a selection of classic Nintendo tunes playing in the background. There are also extensive multi-player modes, but more on that later. Of course all the bells and whistles in the world could not save Tetris DS if the fundamental block-shuffling gameplay was broken. Veteran Tetris players will be surprised at how much easier Tetris has become on the Nintendo hand-held. As a block falls from the top, its shape is outlined at the bottom, showing you exactly where it would fall (though this option can be turned off). 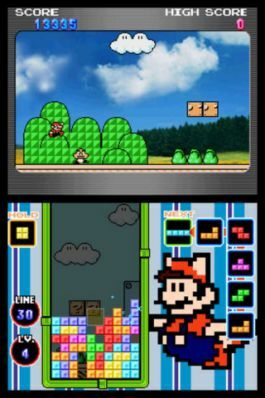 Classic Tetris showed the player which block would fall next, Tetris DS shows the player the next six. Finally, it is even possible to 'store' a brick to substitute and use later, by pressing the shoulder button. While Tetris experts may scoff at such additions, they certainly don't ruin the experience for most players. Games last a little longer now, but that's not such a bad thing. The new additions actually make puzzle mode a good deal more playable too. So what are these great new gameplay modes? Catch is possibly the most radical departure from standard Tetris. Here Nintendo super heroine Samus Aran must fight the Metroids by collecting Tetris blocks onto a floating core. The core floats upwards, past Tetris blocks which will glue themselves to it. Once the core has a solid cluster of 4 or more pieces, a ten second countdown begins before they explode, taking out any enemies that happen to be in the way. If you miss any blocks, or collide with an enemy, your energy is depleted. This mode certainly takes some getting used to but it is an interesting take on the Tetris theme. Mission mode returns to the traditional Tetris format. In this mode, you are given tasks to complete within a time limit, such as clearing a certain number of bricks with a certain piece. This is one of the most entertaining new ways to play the game. Puzzle mode taxes the player with clearing a stack of bricks using a limited number of Tetris blocks. Some of the puzzles are particularly challenging so expect to invest many hours in this mode if you are determined to clear them all.